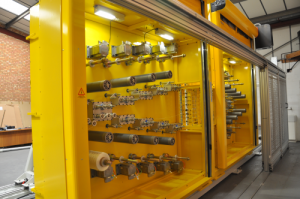 The Russian Nanotechnology Centre of Composites (NCC) located in Moscow has recently placed an order for custom-built pultrusion and filament winding processing lines from the UK machine manufacturer Pultrex Ltd. Both the filament winder and the pultruder are capable of manufacturing large fibre reinforced plastic (FRP) parts in a range of thermoset resins, including polyurethane. This order is a major capital investment of over £1.1 million to expand the Russian NCC’s R & D service offering to include these two key composites processing technologies. Significant future growth is expected in new composite applications using filament wound and pultruded parts. The two machines are now being built at the Pultrex factory in Manningtree, UK, and are scheduled to be delivered and fully operational at the NCC in Moscow by March 2014. The NCC, founded at the end of 2011 as an engineering innovation centre specialising in composites, is a joint venture between the CJSC holding company ‘Composite’, the Fund for Infrastructure and Educational Programs (FIEP), a member of RUSNANO Group, and DowAksa Advanced Composites Holdings BV. The turnkey filament winding production unit ordered is a Pultrex MODWIND 2S-4NC 12000L filament winding machine (2 spindle, 4 axis) fully integrated Siemens Sinumerik production control and data acquisition CNC system which includes full raw material traceability. The machine’s dimensions and specifications provide considerable production flexibility to fabricate filament wound components up to 12 m long and with a maximum diameter of 1.6 m in a single spindle format, or a 600 mm maximum diameter with two spindles in use. The pultrusion line the Russian NCC has specified is a Pultrex Px1000-20T pultrusion machine with 20 tonnes pulling capacity in continuous mode, 40 tonnes in tandem mode with two synchronised and programmable linear controlled three clamp puller units. At the end of the line will be a roller take off table with an automatic continuous coiling unit for drums up to 2 m in diameter.